Candy corn: you either love it or you hate it. In a recent poll of friends and family, half of the group said they were fond of the Halloween snack while the others either reported they couldn’t stand it or made a face like they were disgusted. While I fall on the “love it” end of the candy corn spectrum and could mindlessly pop back kernel after kernel, I set out on an internet quest to find another use for it. I came across recipes for cookies, cupcakes and fudge, but none that would mask the appearance of the orange, yellow and white candies in an effort to throw off the candy corn haters. Thanks to a few clicks of the computer mouse and a trusty search engine, I came across a recipe using candy corn as a main ingredient to make a copycat version of another candy. 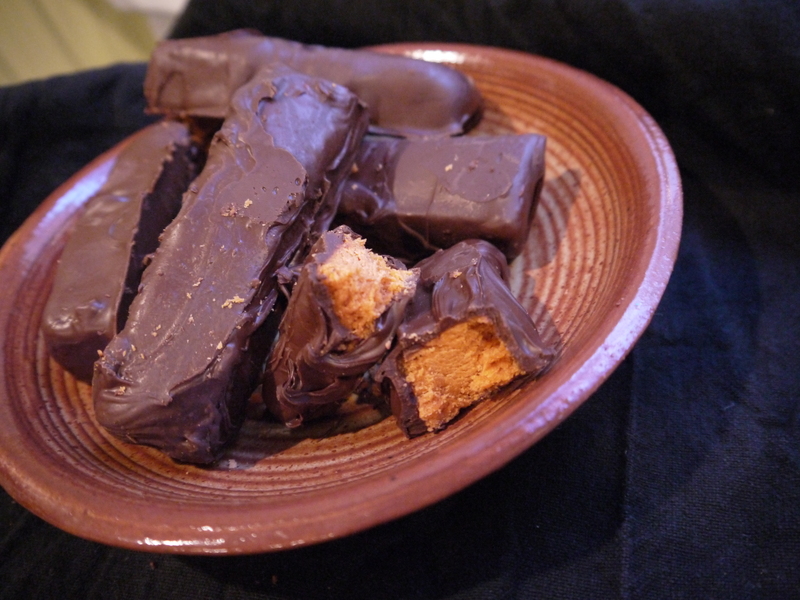 These homemade Butterfinger bars will blow your mind, convert the candy corn opposition and give you something to bring to the Halloween parties you were invited to. I’m not an expert on relationships, but if anyone were to ask me advice I would recommend lots of delicious, home cooked meals for a great partnership. Believe me, I’m not preaching the archaic “a woman’s place is in the kitchen” outlook on life (though it is my dream to be locked away in a fully stocked, state-of-the-art, industrial kitchen all day and coincidentally get paid for it). Simply put: the way to a man’s heart is, without a doubt, through his stomach. Ever since the start of my relationship, I’ve been feeding Joe the best possible dishes I can think of. In the beginning, it was fun to discover what his favorite foods were. On the same token, I learned very quickly what he couldn’t stand; since 2007, my “Chicken Parm” has been “Parm-less”. Parties, birthdays and holidays have been marked with memorable recipes like pastor-style tacos, chocolate bread pudding and apple cider brined turkey. We have also made it through some kitchen disasters, like the Valentine’s Day 2009 homemade lobster ravioli that took us five continuous hours to make; by the time it was ready, we were uninterested. Just as I win Joe’s affections through my meals, he never fails to tell me how great my food is and he constantly brags about my skills in the kitchen. Plus, his dishwashing skills are on point, even after a four-course meal. Now that we are engaged, I feel even more responsibility to produce amazing dishes and am making it a point to create recipes with his favorite ingredients. I’m a pretty lucky girl when it comes to the people I’m privileged enough to call my friends. They’re a really loyal, loving bunch, and I know I can depend on them when I need them the most. Whether they’re offering an open ear, a good laugh, or a shoulder to cry on, I know they’ll always be there for me. Some of them will even give me a big kiss if they know I need extra cheering up, or even if they’re just really happy to see me. Usually, though, it’s if I have food they want; they will do just about anything for a treat. Before you get any ideas, let me clarify that within my tight knit group are a few four-legged “friends.” Dogs seem to sense exactly what’s on your mind and know what kind of day you had as soon as you walk in the door. Though they can’t verbally respond or give you the amazing advice you may be searching for, they can lay their head in your lap to cheer you up when you’re in a funk or even wag their tail in excitement and take a celebratory long walk with you after you get the promotion you’ve been working so hard for.